We last wrote you when we'd just arrived in Chennai. "Out of the Bag" arrived 2 days before us and "Vamp" arrived essentially the same time as us. The Tamil Nadu Sailing Association (TNSA) are our hosts and they've been just wonderful, taking us out shopping, showing us new foods, and making sure that we rarely see any officialdom. We've been taken out to parties and the women(!) got (very rare) tickets to see the World Cup cricket match between Australia and England. 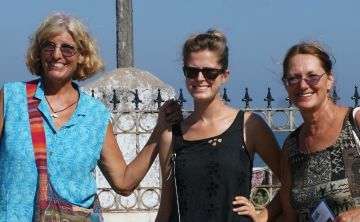 Being the first sailboats to intentionally arrive in Chennai (a Frenchman arrived a few weeks ago with a medical emergency) the press have been making quite a fuss over us. We've taken reporters out for short sails and been interviewed repeatedly. Here are some links to the Indian newspaper articles. 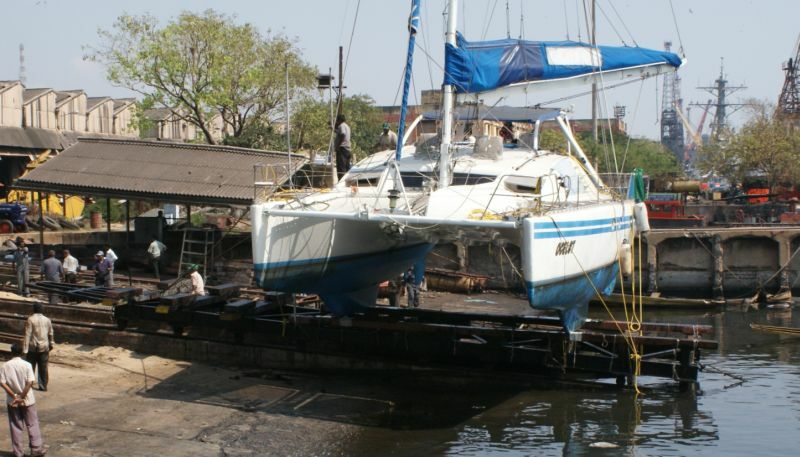 We 3 yachts are now celebrities in India! None of us was seeking publicity but our hosts at the TNSA have been pushing for a yacht marina for years and now that some real yachts have arrived they are trying to make the most of our appearance to stress the need for a marina. Sadly, only 1 of the newspapers picked up on this. This place could be GREAT if there were a clean, secure place for visiting boats. We're being moved hither and yon in the port as they try to figure out where to berth us. We are now Med-moored near the harbor entrance and hope this will be the last move so we can get on with life. Cruising life in Chennai, as the only foreign boats to ever come calling, is really something new for us. These are the MOST hospitable, friendly people we've ever met in all our years of cruising. We've had daily lunches, dinners, shopping outings, get‑togethers, drop‑ins, visitors, press people, touring, birding, WOW. You name it. Poor Rachel, on Vamp, is trying to get her master's course work under control before we travel inland and it's tough to say "No Thank You" when everyone is so interested in us and so interesting to talk to. We all have lots of food on board to use up before closing up the boats to travel but we need time to have a meal aboard! Can't serve meat to our new vegetarian friends. It's been a whirlwind of activity and we're slowly learning our way around this vibrant (and surprisingly clean) city. The 3‑wheel "auto rickshaw" drivers are rogues (local word for them) and we have to bargain like mad to get a reasonable price. Of course the more times we go back and forth to city center and grocery stores the better we get. The ladies, Carmel, Rachel, Gene (off Out of the Bag) and Sue, were given tickets to a World Cup Cricket match: South Africa vs. England. Rachel gave Sue a 1‑hour quickie lesson in cricket rules and then was great at answering all Sue's bizarre questions during the game. Sue actually came out of it understanding enough to be cheering and groaning at appropriate times. They had great seats, high up in the shade with fans on them the whole 6 hours. And good Indian food and filter coffee for refreshments! What looked like a slaughter turned into a close game and a win for England, which had the stadium in a happy uproar. Quite a day! Got home in time to be taken out to dinner ... again! You may remember that we had an argument with a misplaced reef in the Andaman Islands and tore the main water‑seal between our port sail‑drive and the hull. A few calls to Singapore got several parts ordered and (eventually) delivered to us. Unfortunately, the Indians don't realize that parts in transit for foreign-flag boats shouldn't pay import duty, so we had to pay an extra $150 (24%) to get our parts. This not-knowing-what-to-do-with-foreign-yachts goes further, as we're being treated like a ship and being asked to pay port-fees and such that we've never had to pay before. Repairing Ocelot got to be quite difficult. There are several marine railways (slipways) but getting permission to use one involved running around to countless different offices and waiting for endless officials to get out of meetings so they could tell us what ELSE we needed to do. Anto, the TNSA Manager, was a god-send at this part, but we still waited around for 4 days before we were allowed to go up. Once up we replaced the torn water-seal, checked the starboard oil-seals, filled in a few dings with epoxy, and painted where the bottom-paint had been scraped off. We also straightened our slightly bent port prop and ordered a new sleeve for our port rudder bearing. All the work was finished in 3 days, but there was an extra day of bureaucracy before they put us back in the water. We spent a full day cleaning poor Ocelot. The slipway is downwind of the coal-handling facilities (where the coal is dumped on the quay by the big bulk carriers) so we were under a constant rain of coal-dust. Ocelot had never looked so grubby. But the following day we jumped on an airplane and flew north to Calcutta and then Bagdogra, where Vamp met us (they'd been traveling with Out of the Bag while we'd been slaving away on the hard). Then the fun began!